Goerlitz and Tamm (2015) work with a sample of 29,000 German individuals aged 17-64. They have data over seven years, and this makes altogether 107,000 person-year observations. First off, even just looking at the data shows us that people with children are more risk averse. This seems to apply to both men and women with little to no gender differences. Risk preferences were measured on a 0-10 scale with 0 being very risk averse, 10 being very risk seeking. As can be seen in the figure though, the standard deviations (indicated by the black lines) are quite high. So it’s hard to draw meaningful conclusions based on descriptive data. Also, one might wonder why we see these results. Is it because risk averse people are more likely to have children? Or is it because people become more risk averse when they have children? So secondly, the authors turn to some regression analysis. This part of the paper basically looks at how well risk preferences can be explained by the number of years before/after the birth of the first child. The negative effects of the birth of the first child on risk taking are nicely summarized in the two plots below. We can see that for instance, women’s risk preferences drop by around half a point when the child is born (i.e. when the x-axis is zero). The solid lines show these estimates, the dashed lines represent 90% confidence intervals. Risk aversion grows (so the risk preference score drops) even in the years preceding the birth of the first child. While the effect on men is seemingly smaller, statistically speaking there are no gender differences; at least not in this sample. Finally, the negative effects on risk taking dissipate as the child gets older. The birth of a second child doesn’t seem to have a significant effect. This is somewhat strange, but could be explained if either most second children are born a few years within the first so there’s no need to change risk attitudes anymore, or if the changes are more subtle and cannot be observed with this sample size. Two important conclusions can be drawn. 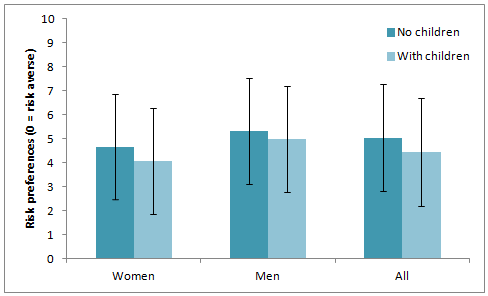 First, while we do observe gender differences in risk attitudes in reality (and also in this sample, see bar graph above), this study shows that this is unlikely to stem from men and women reacting differently to having children. The sources of risk attitude gender differences lie elsewhere. Second, individual decisions (such as whether to have a child) can have an effect on risk attitudes. This is important for methodological reasons: when estimating the effects of risk attitudes on individual decision-making, researchers will have to take it into account that there may be double causality issues. In other words, not only can risk attitudes affect individual decisions, but the opposite is possible as well. Of course, this surely does not apply to all kinds of decisions, but it is something to keep in mind. Also, shout out to the authors for keeping the paper brief and to the point. We need more short economic papers. This entry was posted in Behavioral Economics and tagged parenthood, parenting, risk preferences, risk taking. Bookmark the permalink. ← How far can cultural differences be traced back?